On Monday February 29 at noon, the Shanghai Quartet, along with pipa virtuoso Wu Man, performed an hour-long concert in the beautiful Holly Auditorium on the UTHSCSA main campus. After being introduced by Dean of the Medical School, Dr. Francisco Gonzalez-Scarano, quartet members talked with the audience about the music they were playing. All of the works were by Chinese composers. Additionally Wu Man spoke about the pipa, explaining that it has been around for over 2,000 years, and pointing out how much considerably older it is than the frequently antique (300 years) violins, violas, and cellos that are used in quartets and symphonies. Wu Man played a beautiful solo work for pipa. The performers ended the program with the masterful Ghost Opera by living Chinese composer, Tan Dun. The large audience sprang to their feet in a spontaneous and enthusiastic standing ovation. Many physicians, researchers, and medical students were in attendance, as well as a group of high school health science interns. All were then treated to a nice lunch buffet put out by the Health Science Center. This was a new venue for SACMS outreach and we look forward to returning there in the future. 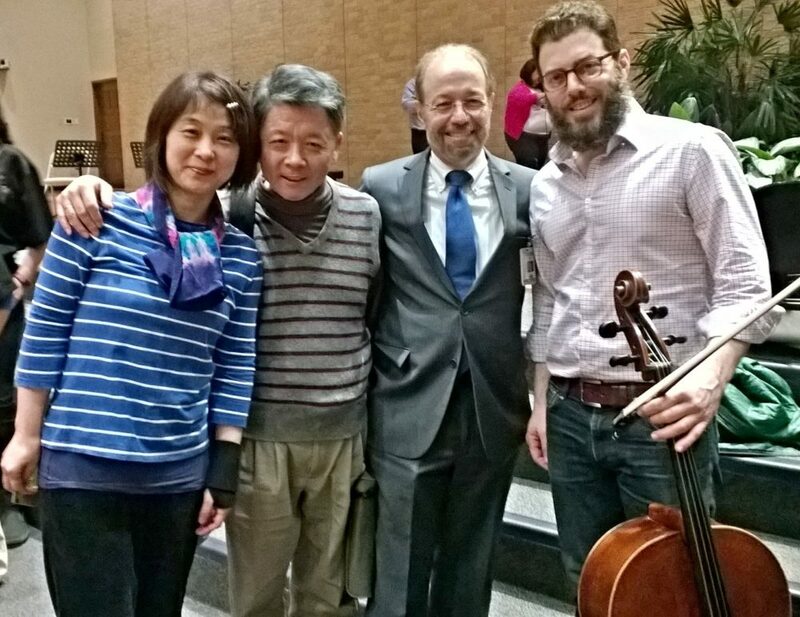 Wu Man and two members of the Shanghai Quartet with Dr. Francisco Gonzalez-Scarano.